From left: Marjorie Moss, Karen Daniel, Eric Blackmon, Gregory Swygert, and Riley Clafton (JD '20) after leaving the courthouse on January 16. On Wednesday, January 16, Cook County prosecutors vacated Blackmon’s conviction and dropped all charges against him. Blackmon was convicted of fatally shooting a man on a Chicago sidewalk on July 4, 2002 – despite the accounts of numerous witnesses that he was at a Fourth of July barbecue at the time of the shooting. He learned to be a paralegal while in prison and worked for nearly 20 years from behind bars to clear his name. The CWC took his case in 2016 at the request of Perkins Coie, who had been appointed to represent Blackmon and secured an evidentiary hearing. In early 2018, the Honorable Ronald A. Guzman of the Northern District of Illinois granted Blackmon a writ of habeas corpus after finding that his trial counsel was ineffective for failing to call at least nine available alibi witnesses. The Seventh Circuit Court of Appeals affirmed shortly thereafter. He was released on bond last year and represented by Ron Safer of Riley Safer Holmes & Cancila while facing retrial. He currently works as a paralegal with the Lawndale Christian Legal Center. Also on Wednesday, January 16, CWC client Patrick Pursley was acquitted of a 1993 murder by a Rockford, Illinois judge, after spending 23 years in prison. Pursley was convicted based on the flawed testimony of a ballistics expert, who claimed that the bullets and cartridges recovered from the crime scene matched, with fingerprint-like accuracy, a gun that had been linked to him “to the exclusion of all other firearms.” Working from his prison cell, Pursley teamed with the CWC and other advocates to pass an Illinois law enabling convicted defendants to conduct post-conviction ballistics database comparisons. He was granted a retrial in 2017, after ballistics comparisons revealed no match between the gun linked to Pursley and the bullets and cartridges found at the crime scene. A team of attorneys from the Chicago office of Jenner & Block partnered on Pursley’s case pro bono. On Wednesday, January 23, Huwe Burton was exonerated in New York City. He was previously convicted of murdering his mother in 1989, when he was 16 years old, falsely confessing after a coercive interrogation. 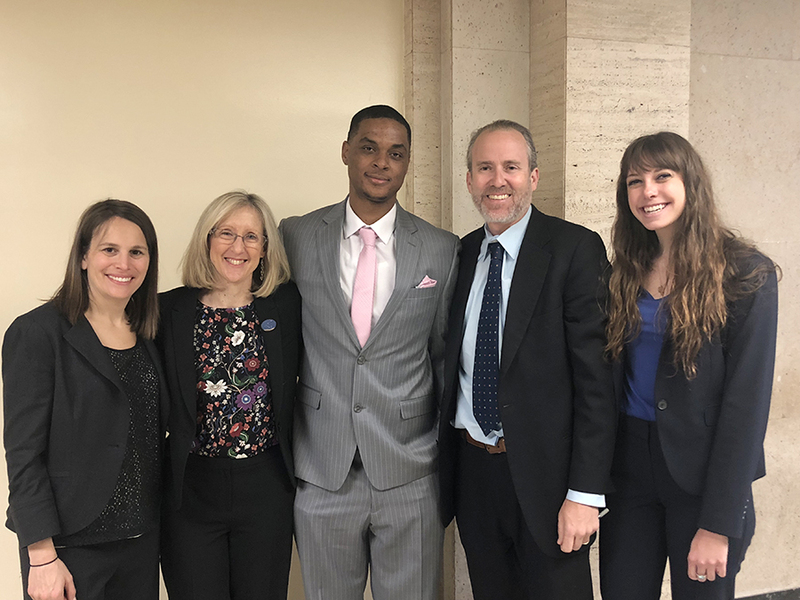 Working together with Rutgers Law’s Criminal and Youth Justice Clinic and the Innocence Project at Cardozo Law, the CWC convinced the Bronx District Attorney’s Conviction Integrity Unit (CIU) to undertake a two-year joint reinvestigation of the case. At the end of this reinvestigation, the CIU recommended that all charges should be dismissed, based on new understandings of the ways in which the psychological pressures of the interrogation room can yield false confessions. As the written order reflects, those new understandings were based on more than a decade of interdisciplinary research, scholarship, public advocacy, and writing by CWC faculty, students, and partners about the ways in which standard interrogation techniques can be so coercive that they can cause not only the guilty, but also the innocent, to confess. Burton, who was paroled in 2009, spent 19 years in prison. As Justice Steven Barrett of the Bronx County Supreme Court issued Burton’s exoneration, he specifically praised Northwestern Law for its commitment to educating students around wrongful conviction cases. “To hear that there’s been public acknowledgement of what was done to me — that’s when I get a bit emotional. It just felt like a weight was officially lifted,” Burton said.